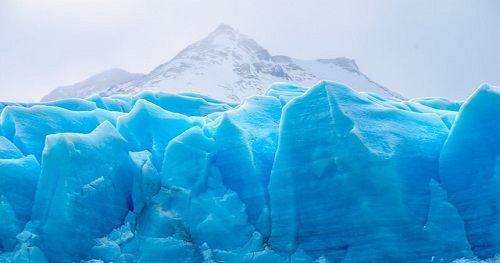 Glaciology: A glacier is an extended mass of ice formed from snow falling and accumulating over a long period of time; glaciers move very slowly, either descending from high mountains, as in valley glaciers, or moving outward from centers of accumulation, as in continental glaciers. Glaciology is the study of snow and ice and their physical properties. More specifically, glaciologists analyze the formation, movement, and effects of the different kinds of glaciers, for example alpine and arctic glaciers, ice caps, ice sheets, and ice shelves. Areas of study within glaciology include glacial history and the reconstruction of past glaciation. There are currently no items matching "Glaciology".